Ready to Wed at Burning Man? Do you consider yourself a Burner? If so, you might remember our mention last year. Burning Man, the annual spiritual-experience/art festival, takes place at the end of every summer, and this year will be no exception. Recently the festival has gained recognition as a wedding hot spot, where many couples journey to tie the knot. 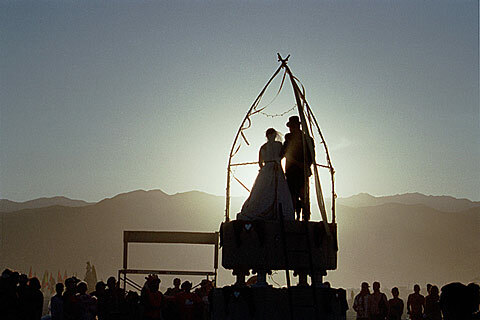 Chapels can be found at Burning Man, though more couples than ever are choosing to use ULC ministers for their ceremonies. In Nevada, there are no legal requirements for what you do or say at your wedding, so let your imagination run free. You can make up your own rituals or have your friends plan the party for you. Freedom, self-expression, tolerance, and inclusion are defining principals of the event; for the right couple this is a perfect environment to wed. In 2008 nearly 50,000 people made the journey to Burning Man, and the event continues to grow every year.